I have been craving some Mrs. Field's chocolate chip cookies lately but there's no way I'm driving all the way to the mall just for my cookie fix. There's a cooking blog I came across recently with some really good desserts. And this is where I found my new favorite chocolate chip cookies! Jamie Cooks It Up! Watch out Mrs. Fields...there's a new cookie in town! They are soft and chewy, and of course, very chocolately. This recipe makes a ton of cookies, so you can always make a half batch. I made the entire recipe so I could send some to work for my husband's guys to enjoy while selling lots of cars on Saturday. Hopefully these will give the guys lots of energy rather than putting them in a cookie coma! 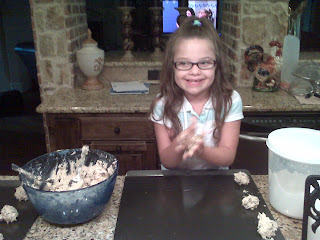 My big girl Taylor helped me roll out the cookies. She loves baking with Mommy. Preheat oven to 350 degrees. You will need 2 non-stick cookie sheets. With a mixer, cream together butter, sugar, brown sugar, eggs and vanilla until well incorporated. In a separate bowl, add the flour, salt, baking soda, and baking powder. Stir to combine. Add the dry ingredients to the creamed ingredients and mix until all the flour is incorporated. Add the chocolate chips and stir with a wooden spoon. Put about 2 Tablespoons in your hands and roll into balls. Place on non-stick cookie sheet. Bake for about 10 minutes. Do not over bake. You'll want to take the cookies out of the oven when they start to crack, then let them stay on the hot cookie sheet to continue cooking for about 5 minutes. Now put at least 2 cookies aside for tasting purposes. Place the rest on a cooling rack, then store in an airtight container when cooled. 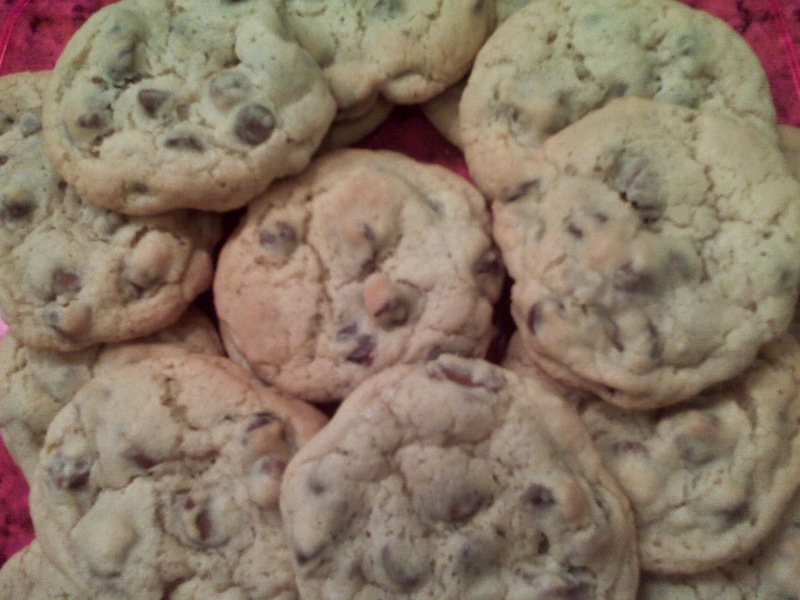 Now pour yourself a tall glass of ice cold milk and enjoy a couple of warm double chocolate chip cookies! Here's my tasting cookies...just kidding...I only ate one...so far.